Help Sammi Van Wicklin Raise Funds to GET RID OF CANCER!!! On a break riding along the Niagara River in Canada! Please help me GET RID OF CANCER with a donation to help cancer research at Roswell Park! Every dollar goes to help research the prevention, treatment and even help find a cure for cancer! They are doing so many awesome things to help get rid of this horrible disease! And this year I applied to be a summer high school research assistant at Roswell so I will hopefully even get a chance to help the doctors and scientists at Roswell find a cure for cancer!!!!! So far I have raised more than $145,000 for Roswell over the past seven years and want to raise more this year. The first year I, when I was 10, I didn't think that I would be able to raise the minimum $100 to be able to ride, and I raised over $4000! So I set a goal of $5000 for the next year and raised almost $7000!!! The next year, when my dad was sent to Afghanistan, I set a huge goal of $10,000 and I was able to raise more than $22,000!!! (and my dad found a bike on his base in Afghanistan and rode at the same time and the same distance as me which was really cool). So the next year I beat that amount with more than $23,000, then over $29,000, and $30,000, and last year I raised $28,500!!! I hope you can help me raise more than that this year! Every year I ride in honor and in memory of so many people who have or had cancer. Some I ride for every year, and there are some new people every year. If you want to donate in honor of someone who has or had cancer, or in memory of someone who passed away from cancer, please let me know their names and I will carry them with me on the ride. PS - my team is forming again this year, Team SBU, in honor of those in the St. Bonaventure University family (which means really anyone because Bonnies are always welcoming!). 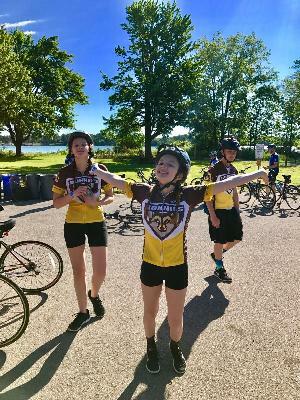 We are riding in honor of Sr. Margaret Carney, OSF, who survived and was treated at Roswell, Jim Canty, who passed away recently from brain cancer, and all other Bonnies who have or had a battle with cancer. Please join us! Happy to support such a committed young lady. Proud and happy to support you again this year!! Mr. Sergio R Rodriguera Jr.